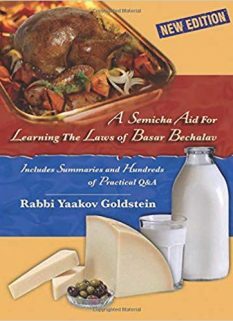 See end of this Halacha for a summary of the practical Chabad custom! It is a Mitzvah to hold the Tzitzis in one’s left hand, in the area corresponding to the heart, during the reading of the Shema [in Shacharis]. 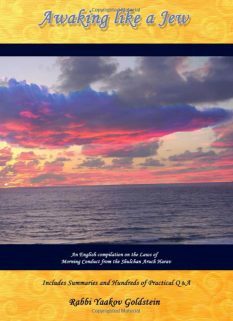 When by Shema is one to begin to take hold of the Tzitzis? Some Poskim rule that one is to begin taking hold of the Tzitzis by the words “Meiarba Kanfos Haaretz”. 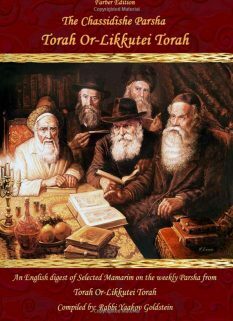 Others are accustomed to take hold of the Tzitzis by the words “Maher Vehavo Aleinu”. The Chabad custom is to begin to take hold of the Tzitzis at the phrase of “Vehavieinu Leshalom”. How many Tzitzis is one to hold during Shema? Some write one is to hold onto only the two front Tzitzis. 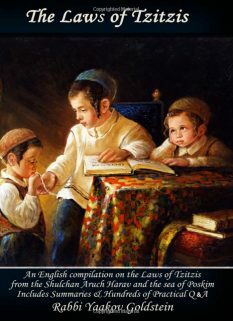 The Arizal however writes that one is to hold all four Tzitzis, and so is the Chabad custom. How is a lefty to hold the Tzitzis? 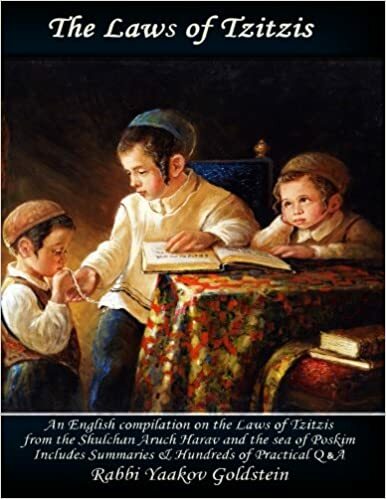 A lefty is to hold the Tzitzis in his left hand, just as is done by one who is right handed. If one is wearing glasses, is he to pass the Tzitzis under his glasses, over his actual eyes, prior to kissing them? It is implied from the Poskim that the Tzitzis are to touch the actual eyelids. Is one to take hold of the Tzitzis when reciting Shema in the morning prior to Davening? Some are accustomed to do so while others are not. 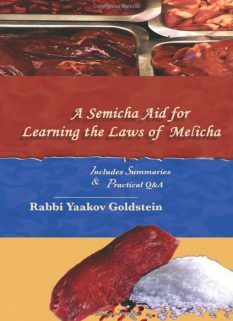 Is a blind person r”l to place the Tzitzis by his eyes during Shema? Some Poskim rule he is not to pass the Tzitzis over his eyes, as doing so appears like he is mocking himself. Others rule he is to follow the same order as everyone else, and pass the Tzitzis over his eyes, and so is the ruling according to Kabala. According to all, he is to hold and kiss the Tzitzis just as is done by everyone else. It is brought in the name of the early Sages that whoever passes the Tzitzis over his eyes during the Parsha of Vayomer is guaranteed not to become blind. Which hand? The Tallis is to be removed using the left hand. When: One is to fold the Tallis immediately after Davening. The Tallis should not be left rolled up in an unfolded position. It certainly should not remain unfolded throughout the night. If one forgot to fold his Tallis until the next morning, then the next day, prior to wearing the Tallis, he is to shake it towards the ground. Who? It is proper to personally fold one’s Tallis rather than give it to someone else to fold. How: The Tallis is to be folded while one is standing. The Rebbe’s custom: The Rebbe was witnesses to pass the Tzitzis over fingers 2-4 and hold the Tzitzis between the index and the thumb [fingers 4-5], hence it would cross over three fingers not two. 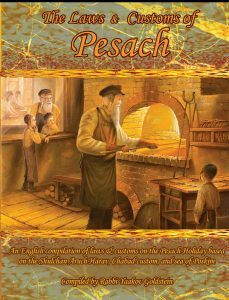 Chesed Lealafim 24/2; Kitzur SHU”A 17/7; Kaf Hachaim 24/18; Ketzos Hashulchan 19/25; See Piskeiy Teshuvos 24 footnote 34 that some are not accustomed to kiss the Tzitzis upon saying the word Tzitzis, as doing so ruins one’s Kavana. Sefer Haminhagim p. 25 [English]; Hayom Yom p. 64; Admur ibid and Michaber/Rama ibid regarding the kissing of the Tzitzis by Ureisem. Sefer Haminhagim p.24 [English]; The Rebbe was witnessed to do at the beginning of the paragraph of Ahavas Olam. See Piskeiy Teshuvos 24 footnote 24; Halichos Shlomo 7 footnote 35 writes that Rav SZ”A placed the Tzitzis over his glasses. Reply of Rabbi Groner, as to the Chabad custom in this regard. See Piskeiy Teshuvos 24 footnote 19 that one is to hold the two front Tzitzis at all times that Shema is recited outside of Shacharis.